Two years ago I visited the Pyramid of the Sun in Teotihuacan, Mexico with my parents. This was an incredible experience, and I learned so much about the Pyramid. The Pyramid of the Sun lies in a valley northwest of Mexico City. It is 207 feet tall, has five levels, and faces the direction of the setting sun. Its top is flat, perhaps because long ago the people who lived here built a temple atop the Pyramid. When I stood on the top of the Pyramid, I could see everything around me stretch on for miles and miles. Under the Pyramid of the Sun is a cave. The people who built the cave dug it in the shape of a cloverleaf, which symbolizes creation, birth, and life. Researchers suggest that the people of Teotihuacan believed their ancestors came from this cave and built up the city around it. Since its rediscovery, the main street in the city surrounding the cave has been called ‘’The Avenue of the Dead.” This street and another that runs east to west divide the city into four quadrants. 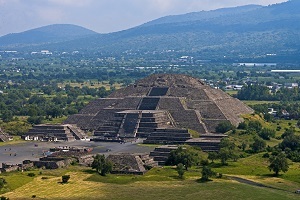 The Pyramid of the Sun sits directly in the center. The Pyramid of the Sun is amazing and culturally important. I was so glad to have the chance to visit it. I encourage everyone who is able to visit the Pyramid, too!